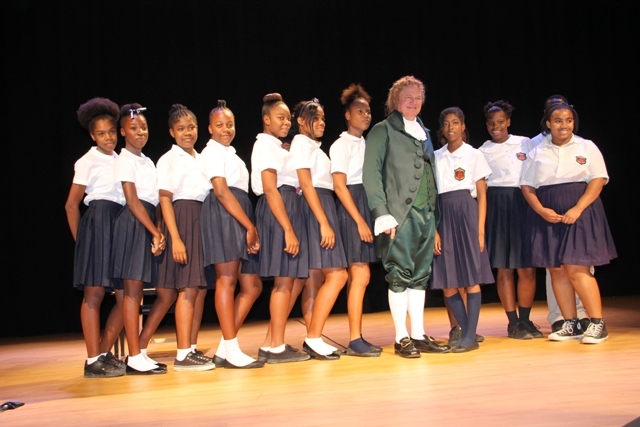 NIA CHARLESTOWN NEVIS (November 27, 2014) — World-renowned author and Alexander Hamilton impersonator Dr. William Bill Chrystal, visited Nevis for a performance and presentation at the Nevis Performing Arts Centre (NEPAC) on Monday, November 24, 2014. 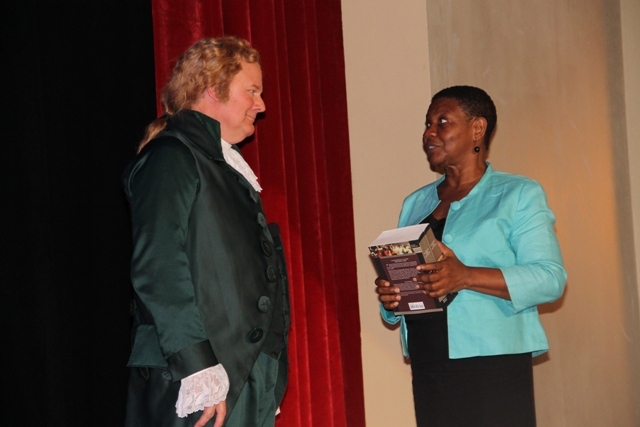 The Hamilton impersonator came to Nevis on an invitation from the Nevis Historical and Conservation Society (NHCS). Executive Director of the Society Evelyn Henville, gave some background information at the event about Dr. Chrystal and his visit to the island. “Dr. 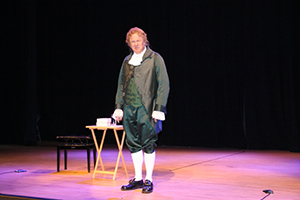 Chrystal is the number one impersonator of Alexander Hamilton and this is his life’s mission, to bring to life the goodness and charm and intellect of Alexander Hamilton and his accomplishments,” she said. During his presentation, Dr. Chrystal spoke of Alexander Hamilton’s accomplishments throughout his life before and after he left Nevis. Throughout his impersonation of Hamilton, this is some of what he said in his Hamilton voice. 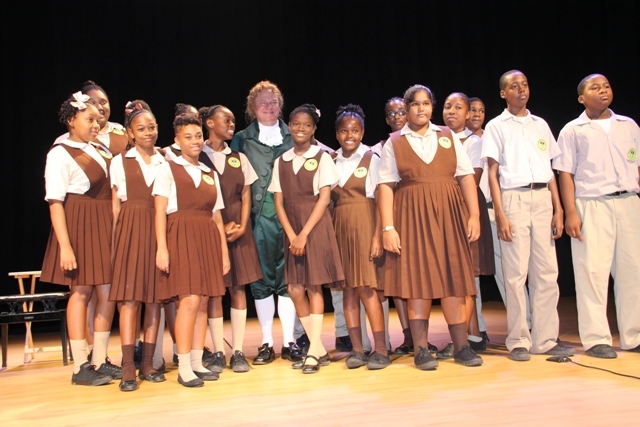 Dr. Chrystal also donated copies of “Plutarch’s Lives” to all schools on Nevis. He said Hamilton read volume one and two of the book which he used as a guideline throughout his life. Principal Education Officer in the Department of Education Palsy Wilkin accepted the books on behalf of the schools and expressed thanks to Dr. Chrystal. 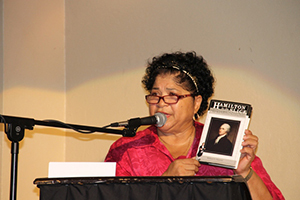 “Thank you for coming so far to really enlighten us on the life and times of Alexander Hamilton,” she said. Alexander Hamilton was born in Nevis in 1757 and later moved to the United States where he eventually became the First Secretary to the United States Treasury. He is also described as a founding father of the United States of America.